Outdoor heating systems can present some challenges – especially the low-priced portable propane patio heaters from home improvement stores. Common issues with these models include ignition buttons that don’t work, stainless steel that’s not rated for outdoor use, heating units that don’t project heat far enough and the inconvenience and cost of refilling the propane. 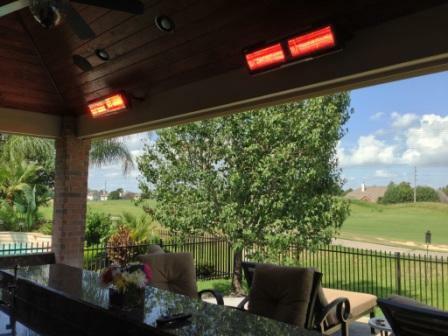 Electric outdoor heating systems, like the infrared quartz model above, offer the convenience of warmth on-demand whenever you need it, without the hassle of running the gas line needed for models that run on natural gas. 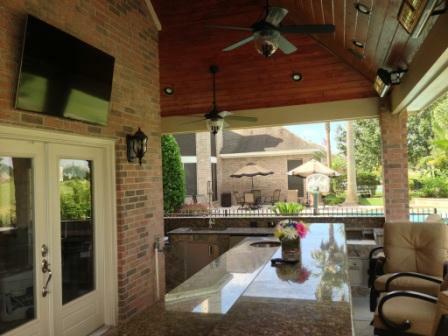 Here are some more images of our Houston outdoor design projects featuring outdoor heating systems. Why quartz infrared red heaters? Conventional heating systems produce heat energy in the long and medium waveband. Consequently, this type of heating system offers high transmission losses. Heat rushes out when cold air rushes in. Quartz shortwave heating technology, however, provides radiant heat energy that instantly warms people and objects within the beam of heat. • A low operating cost of about $0.15/hour (based on electricity cost of $0.08/kilowatt hour). • Instant heat with no initial warm-up time. • A reliable heat source that won’t blow away or fail to start. • A silent, odorless source of heat with no products of combustion. We also install quartz infrared heating systems with wall or ceiling mounting that maximizes floor space with no storage of bulky propane gas bottles. If you choose an electric outdoor heating system, you’ll, need a 220-volt circuit for the electric (most houses only have a 120-volt circuit), and this should be installed by a professional for safety’s sake. If you go with an outdoor heating system powered by natural gas, meanwhile, you’ll likely need a gas line installed. Outdoor heating systems powered by natural gas cost the least over time, even though the initial investment is higher. 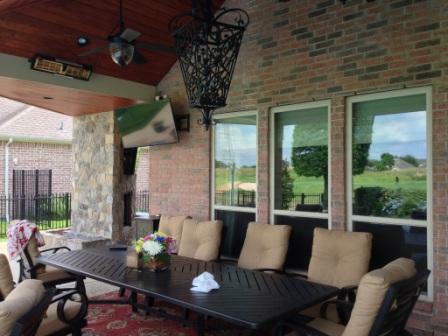 A professional outdoor living space designer will also put your outdoor heater the perfect spot for optimal performance and visual appeal. They’ll also know the ups and downs of different brands and can steer you toward a product that won’t let you down.